Walk in closets are a unique room in your home. 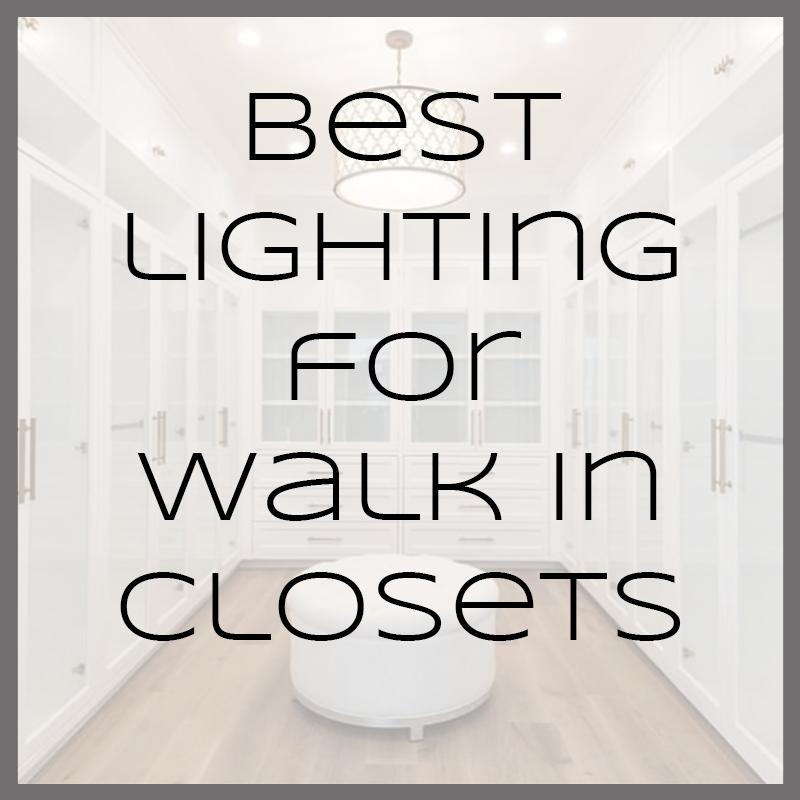 Usually overlooked and too often not well lit, we will give you our favorite lighting design tips and fixture types for walk in closets. Flush mount light fixtures are probably the most common form of lighting in closet areas. With good reason; they are less expensive in price, come in hundreds of styles and colors, as well as several sizes. Problem with flush mount lighting is, the light is usually too muted, soft, or diffused, for a closet. Can you do a decent job lighting a closet with a flush mount light, sure, if you get one with enough light bulbs. Over and over again we see customers use either a small one light or medium two light fixture in their closet. Even in a very small closet, that’s not enough. You really need something with at least 3 – 60 watt light bulbs to get enough light. Even then, because of the diffused light, it may not be enough. But this brings up a separate issue, will a larger fixture fit? Since we don’t know your closet size, this would be a judgement call on your end as to whether a fixture is too large for the space. However, if it is too large, then it just looks weird, creating another problem. We recommend as much light as possible with minimal size, so using a flush mount light is generally not a good idea in our opinion. If you have recessed lighting in your closet you wouldn’t be alone. It has been a popular option in new homes and remodels over the last decade plus, mostly because of the ease of install and the low cost. However, recessed lighting would be lower on my list when it comes to lighting a walk in closet space. Easy to install in new construction or remodel. Low cost per unit compared to other lighting options. Decent amount of light (although not in the correct way, we will explain). Low profile – Doesn’t protrude from the ceiling at all. Light is directed straight down. This is really the only con that I have for using recessed lighting in a closet, but it’s a MAJOR con. Using a straight down light will create a lot of shadowing and dark spots all over the room. The reason for this is the bulb type that cans use. The flood light bulb used in cans has an A shaped pattern directed down from the ceiling, resulting in the shadowing and dark areas. You can overcome this somewhat by installing multiple recessed cans closely together, but that’s not always an option, depending on your closet size. One of the ways you can fix the issue with recessed lighting in a closet is to use an adjustable trim. The type of trims allow you direct the light where you want it, which would be on your clothes and off walls for reflective lighting. However, in order to get the amount of light you would require for the closet, again you would need several recessed cans installed in the ceiling. Some smaller closets may not have the necessary space to do accomplish this. My recommendation of using a semi flush mount light fixture come with a caveat, your closet must be large enough to handle it. If you have a standard ceiling height, 8′ or less, and less than 50 square feet, I would recommend recessed lighting with adjustable trims. Better yet, see below for our BEST recommendation, it will work for smaller closets as well. Semi Flush light fixtures hang down slightly from the ceiling when compared to a flush mount light that is tight to the ceiling. The advantage that a semi flush has over other lighting fixtures is the size of the light bulb you can use. Flush mount fixtures are limited to 60 watt bulbs because of the enclosed glass. In a semi flush fixture you are able to use light bulbs up to 100 watts each , providing a significant more amount of light. The other advantage is the way the light is reflected off the ceiling. Normally in a semi flush fixture, the light bulbs are not covered by glass on top, allowing light to reflect off the ceiling. This effect is very important as it eliminates a lot of shadowing created by other types of lighting. The reflection of light off the ceiling will also make the room feel much larger and open. I know what you’re thinking, “track lighting?” “who uses track lighting these days?”. Well, we do, and you’ll be blown away at how good it is for this use. Easy to install – Track lighting is actually pretty easy to install. Depending on the size you use, it may just install directly to the junction box. If longer pieces are used, just a couple of sheet rock anchors does the job. Low profile – The track itself is very small and does not protrude from the ceiling more than an inch or so. The fixtures, depending on what you choose, will only hang a few more inches from that. Keeping everything nice a tidy. Precision – Each track light fixture can be aimed to a specific location. You can create an almost perfect lighting situation with this option. Expandable – One of the best features of using track is the ability to add lights if you need it. Is there a dark spot on your clothes rack driving you crazy? Add a light to the track and fill in that area! Configurable – Oddly shaped closet? No problem! Track has every type of connector available to make bends or corners with ease. Even if your electrical box is in the wrong location, track can be installed, getting the power wherever the track meets the box. You can’t do that with a standard light fixture, it has to mounted where the junction box is located. Amount of light – The amount of light you get from track light heads is pretty incredible. Bouncing light off walls and directing it where it should be will change your thinking of how light should be used. Style Options – There are hundreds of styles available for track heads and track. There are also numerous sizes and bulb types to choose from, like halogen and led options. Price (sort of) – I say sort of because you can select some pretty economical track lights, or kits, to keep the price down. However, if you decide that you want a lot of fixtures on your track, the price can start to creep up. Also if you select higher end led or low voltage track heads, the price can also start to climb. However, this is the same with whatever type of light you choose, there are more expensive and less expensive options.